4.5 stars. I honestly didn’t expect to like this book much when I found out it was centered on Scorcher Kennedy, a massive annoyance in the French’s last book, Faithful Place. Kennedy cares a lot about how he is perceived and can come off a little strong and brash. To my surprise, this was my favorite Dublin Murder Squad book so far. I’d never want to be friends with Detective Kennedy, but he’s a great character to read about and the mystery was fascinating. A family is found dead in a mostly abandoned development outside of Dublin. The only survivor is the mother, Jenny Spain, who is in intensive care. The facts look simple at first, but then Kennedy and his rookie partner, Richie, start finding signs of some weirdness in the Spain household. There are baby monitors everywhere and cameras pointed and smashed in holes in the walls. Jenny had suspicions of an intruder for months and someone has tampered with the internet history after the murders. Of course, French has to give Kennedy some personal drama as well. His mentally ill sister is having a breakdown and it’s bringing up all sorts of memories from his past. French gets the balance between personal and private just right in this book. Kennedy is a complicated character and it’s fun to watch him squirm. The partnership between him and Richie is a highlight. It’s so well written and you really root for the beginnings of a beautiful relationship. 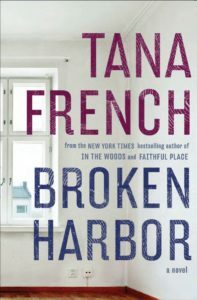 After the explosiveness of the Mackays in Faithful Place, the restrained turmoil of Broken Harbor makes for a nice change of pace. Share the post "I don’t even know why I was surprised that I liked this so much"
I’m constantly surprised by her books as well, although you’d think I’d learn my lesson. I didn’t really like Frank or Scorcher, but both of their books were great.